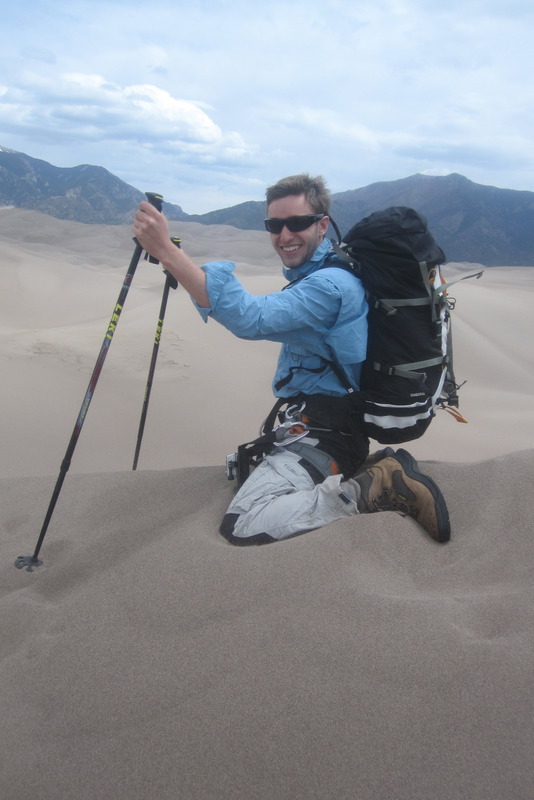 While Colorado is most often associated with her beautiful mountains, there is a small section in southern Colorado that has enormous sand dunes. Formed millions of years ago, Great Sand Dunes National Park sits at the base of the Sangre de Cristo mountain range where blowing sand against the mountain has created the largest sand dunes in North America. The tallest, Star Dune rises 750 feet from the creek bed. Looking from the distance, Great Sand Dunes offers an amazing juxtaposition of sand dunes landscape next to the majestic Rocky Mountains. While Alex and I had an adventure here some 10 years earlier when we took a first place ribbon at the annual sand building competition, our purpose for this adventure was much different. We were here to get in some vertical climbing in preparation for our June trip to Mt. Rainier. As such, we decide to go with full packs on. 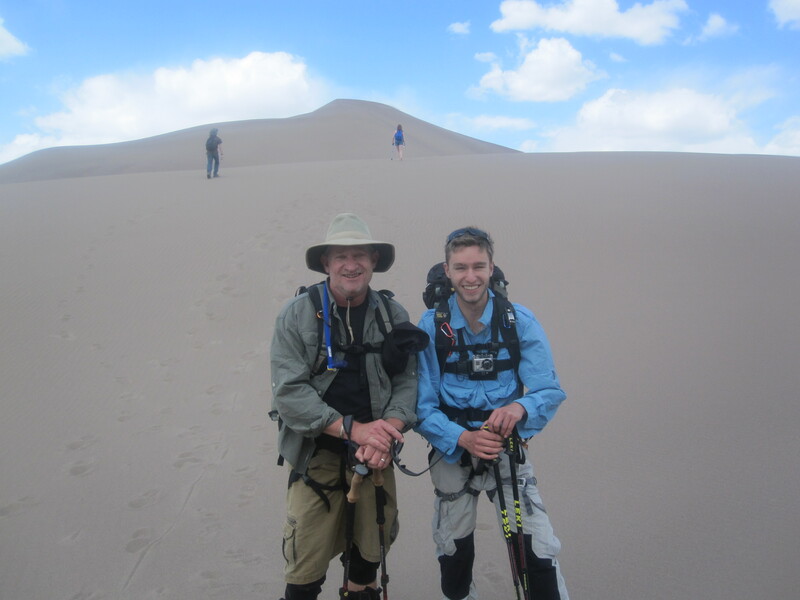 Our course was to climb the High Dune on the east side and then walk right through the middle of the dunes over to Star Dune. We could then easily descend down to the valley floor and follow the creek bed back to our starting point. If you’ve ever walked through dry sand, you know how much it gives way underneath you. What makes this hike so challenging is that you are sinking in while doing some major vertical climbing. Many a time it felt like one step up and two steps back. To make matters more difficult, the wind howls constantly and the higher you get the more ferocious the sand storms become. After reaching the top of High Dune, and enjoying watching the many sand boarders who ride down the dune), we headed out across the middle. 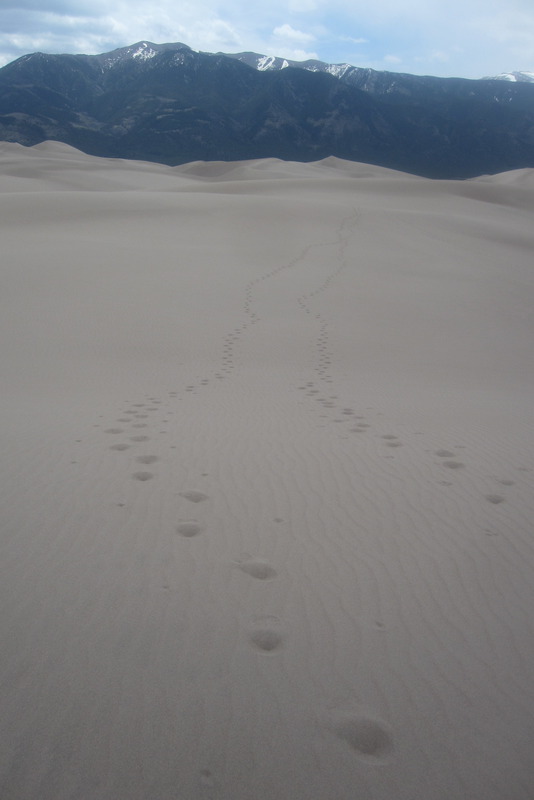 After descending the back side of High, we were treated to an awe inspiring scene of nothing but sand. Every direction we looked, nothing but sand and the blue sky above. To feel like you could get lost in here is an understatement. While hundreds of tourists were at play just a quarter-mile away, it felt like Alex and I were the only two people on earth. The climb across the dunes was extremely enjoyable. The climb up Star Dune however was a huge challenge. Between the loose footing, the steep slope, and brutal wind gusts, I was down to counting 20 steps before needing to take a rest break. When getting to the top, you quickly get to the back side of the ridge to avoid being sand blasted by the wind. Inspired at the top, we decided to go back the same way rather than going to the creek bed. While a much more difficult traverse, we couldn’t resist the temptation to play in the sand again. For me, having trained in the pool for the past three months, I finally felt I had reached a level of fitness that made it fun to pack and I was encouraged about our upcoming climb up Mt. Rainier. This memorable hike stayed with us for days as we continued to wash sand out of our hair and ears! What takes six hours to ascend and only an hour and a half to descend? Mr. Rainer! All you have to do upon leaving Camp Muir is sit down, lean back and then pick up your feet. Your ice ax or hiking pole serves as a steering wheel and brake, and gravity is the horsepower. The only decision you have to make is if you want to start your own chute or follow in the tracks of the hikers from the day before. Glissading is the optimal way to make a speedy return to Mt. Rainiers Trial Head at Paradise. It is simple, safe when done properly, and insanely fun! The August sun melts the mountain’s top layer of snow during the day, then cold nighttime temperatures refreeze it creating an iced run of Olympic quality and magnitude. For those hikers with younger knees and ankles, you can also glissade by combining techniques of running down the mountain and sliding on your feet. That requires a lot of agility however. In either case, it’s good to have waterproof pants because once the slide has started there is no stopping to shake out your shorts. So, like a roller coaster, just sit back, strap in, keep your arms and feet tucked, and enjoy the ride! We always thought of zip lining as something you did at a team building camp or above the canopies of some rainforest (the later one being one we’ve yet to try). 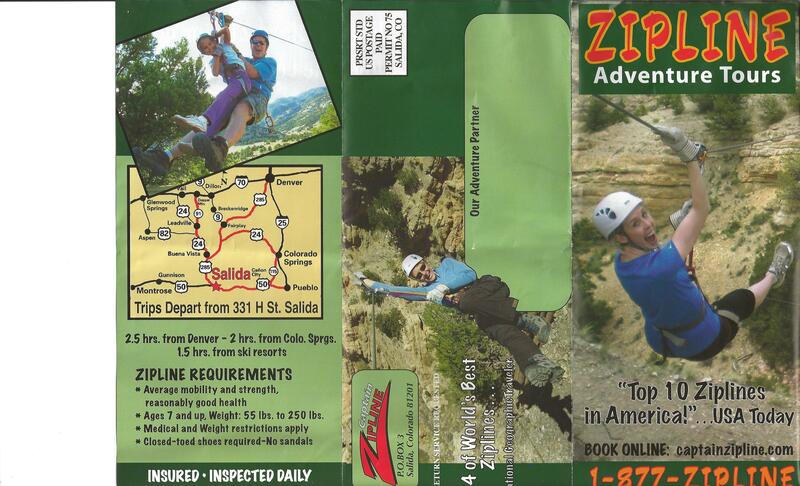 Needless to say, we were excited when we heard about Zipline Adventure Tours located just outside Salida, Colorado. CaptainZipline.com offers a variety of packages including nature and history tours of the surrounding area. We chose the Zip and Sip. 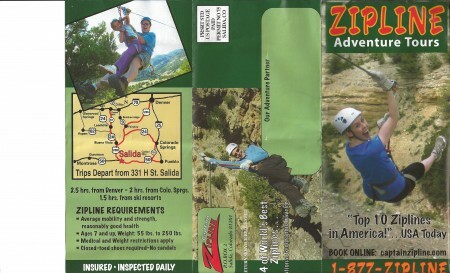 A two-hour late afternoon zip line experience with coupons for beverages at one of several Salida establishments. We chose the local brew pub for a root beer and fresh brewed IPA. The instructors were very helpful and fun and were particularly patient with those whom were a little more anxious with sailing over the canyons below. Mounting the Go Pro video camera on my helmet made for some fun shots! While my father liked the idea of fly fishing, he never really had the patience or fine motor skills to become a proficient fly fisherman. Subsequently, I learned mostly on my own. Though I’m decent at it, I’ve never known the techniques or secrets to becoming a great fly fisherman, let alone, know how to teach them to my son. That all changed this past fall when we hired a guide, Steve Brown, for the first time. While not inexpensive, it was well worth the money and taught both of us some lessons which we have continued to apply. In addition, the excitement of seeing my son catch the Colorado trifecta (Rainbow, Cut Throat and Brooke), as well as, share in the fun of male jocularity with Steve and his many great stories of life and fishing was a great bonding experience for us. We hope you enjoy this clip of fishing off Lizard Head Pass just outside of Telluride, Colorado. We never did catch a Brown trout but caught a whole lot of fun and excitement. As for Steve, guess who got him into the love of fly fishing? His dad of course! One of the advantages of my career choice is being able to watch various trends rise and fall with each generation. Over the past 15 years, I’ve loved observing an increase in social action among high school and college students. In addition to the Green movement, many high schools are requiring community service as part of their students’ commitment to National Honor Society. Recently, I had the privilege of joining Alex and three of his friends from the National Honor Society for a day of seed planting and raking in a burn area outside of Boulder, CO. Along with a whole lot of fun and laughter, we all walked away with sore muscles and a profound appreciation for the power of fire. The scale of devastation was only matched by the stories of loss from the homeowners we met. For the four young men, it’s a memory that will last a long time and one that will guide their outdoor choices (this fire was started by man) and desire to help those who have suffered loss. Doing volunteer work with your kids no matter what age is one of the greatest adventures you can have and one that will pay off for years to come. You are experiencing great times together and planting values that will grow for generations. On this trip, we got to meet Senator Mark Udall of Colorado. He spoke with the boys about America’s history of volunteerism and how charitable action is the backbone of our Country. Enjoy the film, get involved and have a whole lot of fun! This story was sent in by AdventureDad Doug and his son. 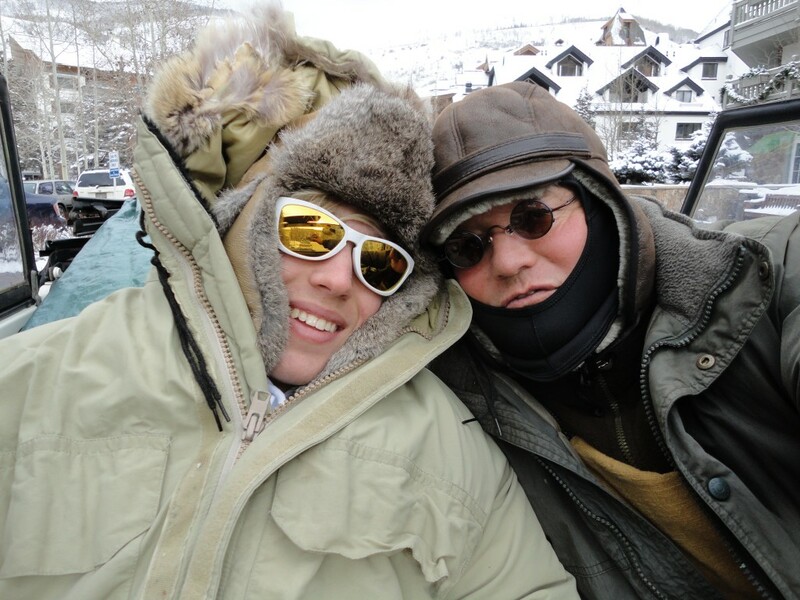 Once again, the two of them have mastered the art of finding opportunities on the slopes! “Hey Dad, can we ride the Storm King lift and make some turns in Spaulding Bowl?” That was the request of my son Jordy, a 12 year-old who likes to ski steep, ungroomed terrain, just like his dad. I agreed to his plan and we headed up the first lift, and then the second, only to learn that the surface lift was out of order. Bummer. But wait, it was Christmas weekend and the Copper Mountain Ski Patrol was not about to disappoint us or the rest of the eager skiers seeking this prime part of the area. To our delight, we found them running two snowcats up Spaulding Ridge, and we hopped in line for this rare treat of an enclosed trip to the top. 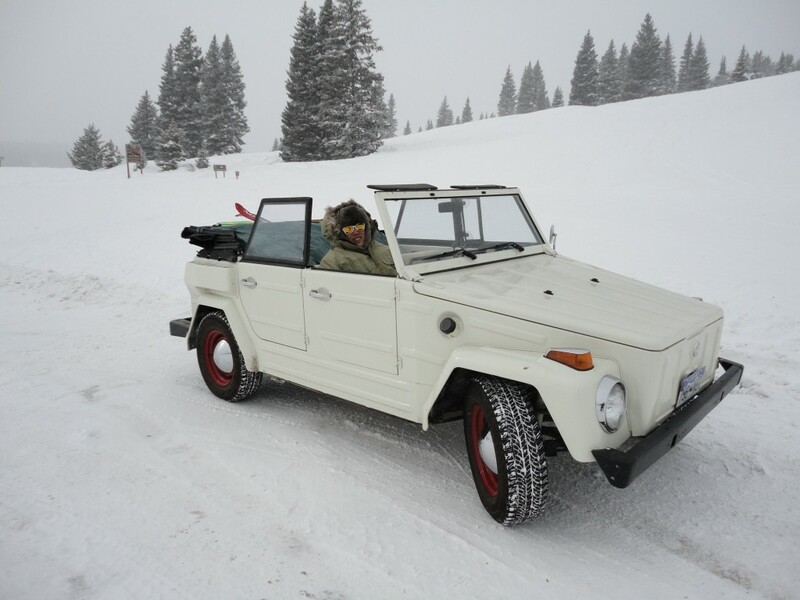 When the huge machine showed up, we stowed our skis in the rack on back, and climbed in to the comfy seats for the five minute rocking ride. My smile and excitement fed Jordy’s, and we piled out, put on our gear, and skated to the cornice of a run called “Patrol Chute,” the steepest on the mountain, to celebrate our first-time up via a snowcat, and our first run of the day in honor of the crew who made it possible. Check out this story sent in by Doug. Thanks Doug, great job of taking advantage of a unique opportunity with the snow patrol! The anticipation was great, our first ski days of the new season. And early this year! With the November snow came a Thanksgiving outing to our favorite Front Range ski area, Copper Mountain. 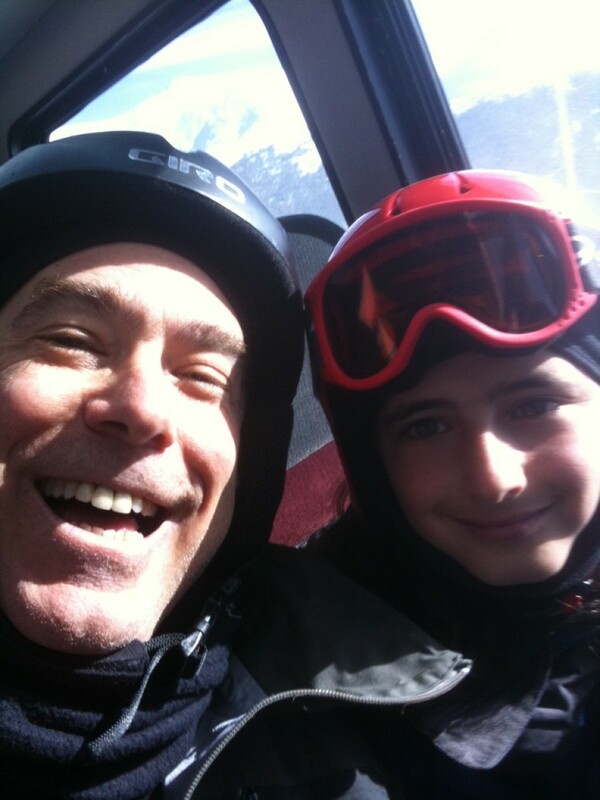 The anticipation may have been greater for me, a fellow Adventure Dad, because of the breakthrough last ski season when my son Jordy, then age 11, became my full and true ski buddy, a fellow double-black-diamond skier. We are not boys for the bumps, by the way, as we don’t seek out and spend time on the many mogul runs that some skiers relish. Rather, Jordy shares my longtime passion for the ‘sidecountry,’ the steep, deep, untracked powder and crud that makes every run and each turn a mystery and wonder to be encountered and conquered. And so, with that mystery on our minds, and the delight in our hearts, Jordy and I took to the lifts of Copper Mountain on the day after Thanksgiving, looking to ski the lines that would challenge our legs and our love of untracked snow. Off we went with haste, not wanting to miss this unique opportunity. We arrived at the first ski patroller perched on the ridge above a series of choice runs, none of which had been opened yet this year, and we asked what was happening. 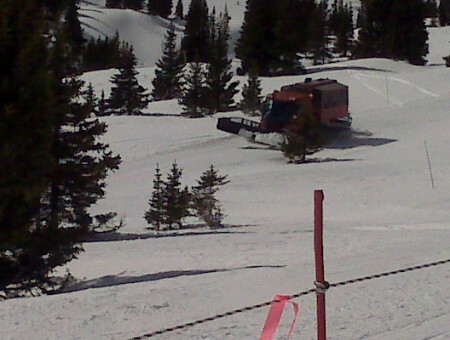 “Directed skiing,” he replied, “Ski down to the next patroller and he’ll tell you where to go.” WHOO HOO! We skied off the ridgeline and into the deep snow, untracked and ready for us to carve are place in the face. Who could have imagined our good fortune to be among the first few folks to gain access to these runs this season? We waited for direction, noting nearby the huge hole and surrounding grey snow that told of a recent powder charge explosion. Ski patrol was using all of their arsenal to safely open new terrain. We enjoyed a total of three laps on these runs, each involving a new line on fresh snow, each cause for celebration. Our season was off to a great start, and Jordy and I had a great story to tell Maggie at day’s end. Day two found us back at it, still celebrating our first day good fortune, as we lined up for a ride on the Storm King surface lift that drags one skier at a time up a steep ridge where, when the season is in full swing, many great options abound. This ride was more about the view on a sunny, warm day, and we fully expected that our best option would be an easy cruise back down the ridgeline. We should have known that directed skiing was happening everywhere that weekend, for those brave and lucky enough to stumble upon ski patrol at work, and to venture where no skier had yet been this season. Indeed, when I asked the lift op at the top, he confirmed that ski patrol had entered Spaulding Bowl just 15 minutes earlier, and that adventurous riders were welcome to traverse over and be among the first to make turns in that area. The final patroller we encountered warned us to use caution on the cat track that we’d be skiing to exit this area, and both Jordy and I skied in control along the road leading out. Gradually I found myself riding higher up on the left rise of the road, Jordy up ahead about 20 yards, as two other riders simultaneously overtook me at much greater speed. Suddenly I hit a large, concealed rock and skidded to a stop, jamming my arm into the unyielding impediment. Immediately I scanned my body, focusing my awareness to determine if anything was broken or badly hurt. My left arm ached, my fingers felt cramped, but as I arose from the snow it was clear that I was lucky, and had escaped serious injury. Jordy shouted his concern, “ARE YOU OK, DAD?” and I assured him so as I rolled off the road, under a rope, to compose myself and assess my equipment. Although I blew out of both bindings – a rare occurrence for a telemark skier – the only issue was a broken safety cable, and once I was back into my gear we cruised gingerly down to the base, pleased for another directed skiing adventure, and content to call it a day. Later, over a plate of barbeque with Maggie and Jordy, I asked my son what he would have done had I been hurt more seriously. “First I would’ve cared for you, Dad, and I would see if your cellphone had service, and flagged down other skiers to help us.” WOW! Perfect, assess the victim, use resources to get assistance, he’s got it, and in spite of a bashed up elbow, sore arm, and stiff fingers, I feel great knowing that my son and I have enjoyed the first great adventure of another promising ski season, together, doing what we love. Epilog – Our next chance to ski Copper Mountain was on Christmas Eve, and although most of the area was open, and Directed Skiing merely a fond memory for this season, we were again grateful to ski patrol. You see, the Storm King lift was inoperable on this day, requiring the use of a pair of snow cats to transport skiers up Spaulding Ridge. Another unexpected treat was a ride in a cat…but that story is for another time. My 16 year old son Peter has lived in Wisconsin his entire life. My name is Nick and I live in Colorado. One of life’s tangled webs landed me in a long distance fatherhood situation that despite its inherent heartache – became the biggest blessing in my life. The love of a father for his son conquered all obstacles in “figuring out” how to build connection over geographic expanse. A friend recently pointed out that many families living under the same roof don’t necessarily have atunement and connection. Between professional careers, social medias, video games and the myriad of other societal distractions and disconnects – some families lose touch with the importance of true one on one quality time with their kids. The blessing of my situation has been that the quality and depth of the relationship with my son evolved from a commitment at his birth to be “present” in his life. Although our time was limited to 4 four day visits per year for his first 8 years – we enjoyed uninterrupted joy together. The attached pictures were taken last summer when Peter came to Colorado for two weeks. 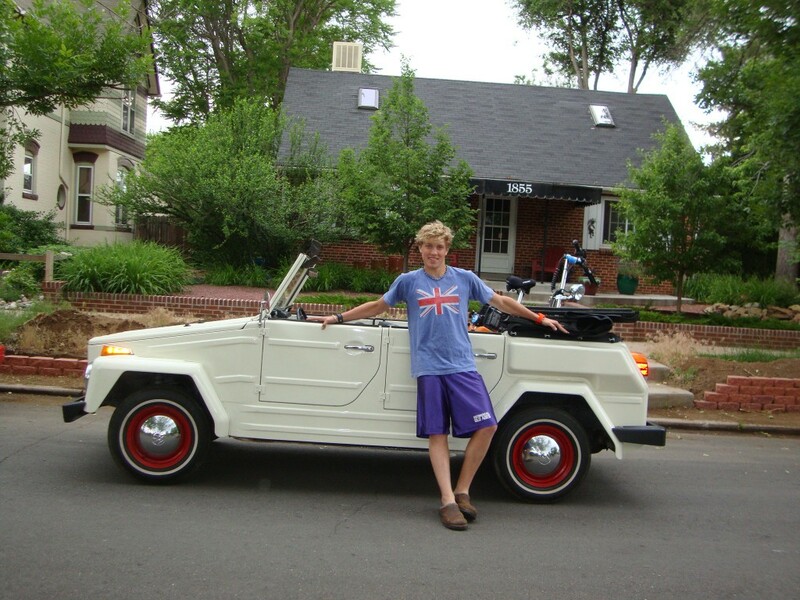 We packed the VW “Thing” with camping equipment – whistled for our Dog and hit the open road west into the Rockies and eventually south into New Mexico. We disappeared for 8 days and saw some amazing beautiful landscapes following our mutually adventurous souls without an itinerary or calendar. We chugged through Minturn, Leadville, Aspen, Carbondale, Crested Butte, Lake City, Silverton, Telluride, Durango, and eventually into Ojo Caliente New Mexico. 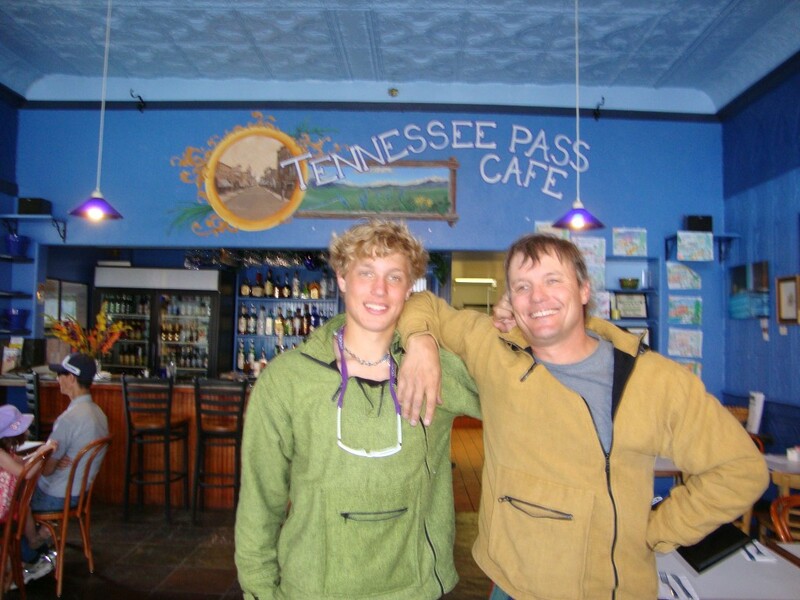 On the road – without all the buzzy distractions of everyday life – a sense of connective “nirvana” happens between father and son by way of quality conversations, spontaneity and humor – all intertwined with comfortable silence affording the time and space to absorb and reflect. To truly “feel” the love. Our Jimmy has over 165K miles on it and has taken us over many a mountain. In this clip, you’ll see, that the descent down the pass was much more aggressive than the climb up. The camping rack in the hitch made things even trickier and had to be taken off on one occasion. Overall, it was rather unnerving but a great adventure in retrospect. Next time, we will rent a Jeep!